Twelfth Night at Vaughan’s, 2019. Pictured on left: Peggy Johnston. It was a Sunday afternoon in January. At the corner of Dauphine and Lesseps, a canopy of wood slats and rusted tin sagged over green cypress beams, and neon beer signs and Christmas lights glowed in the windows. 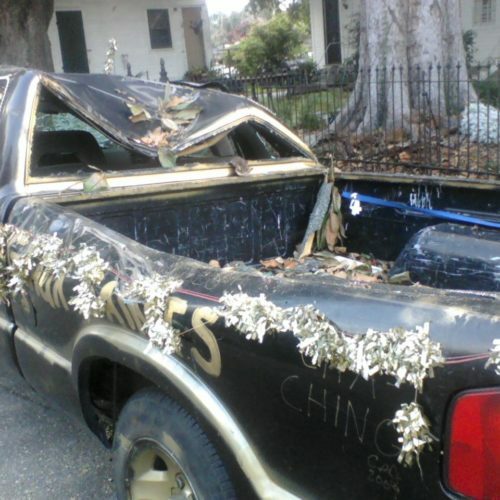 A black pickup truck adorned in gold paint and garland waited on the curb. A multitude, wearing black and gold, converged on Vaughan’s Lounge. 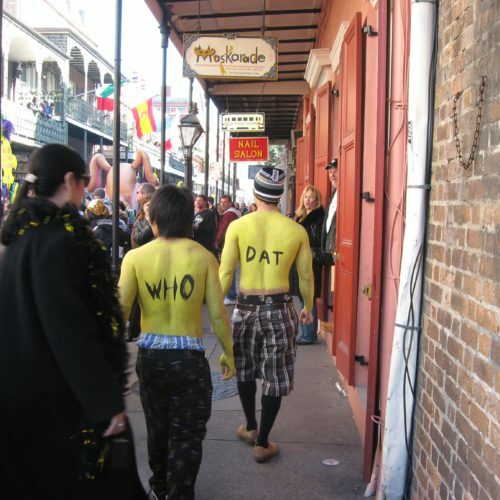 New Orleans was preparing for the biggest football game ever to be played in the city. The Saints were to play the Vikings in the Super Dome for their first trip to the Super Bowl. Everyone in the city, or so it seemed, was paying attention. Inside Vaughan’s, a television flashed the pre-game show from atop the cigarette machine in the corner. The jukebox glowed silently with its array of jazz, Blues, R&B, brass bands and classic country. The sun shone low into the windows. As the room filled, the light fell and the chatter rose to a din. The “cheerleader brigade,” ladies bedecked in black and gold hats, earrings, scarves and face paint, positioned themselves in the front row of the chairs arranged to face the television. In the minutes before kickoff time the sun sank behind the rooftops. Someone pulled the chain on the florescent light affixed to the low ceiling and the room went dark. Dee, one of the cheerleader brigade, stood and turned to the crowd to lead Drew Brees’s locker room call and answer. Vaughan’s is what most people would refer to as a “dive.” Dingy yet festive. Concrete shows through bare patches in the linoleum in the front half of the bar, where a canopy of purple green and gold garland festoons the low ceiling, borders the two windows that face Dauphine Street, and wraps the posts of the wooden railing that divides the room. Beyond the railing, the ceiling opens up high above the bar on the back wall, elevated a foot and a half on a worn wooden floor. Christmas lights twinkle along moldings and shelves populated with liquor bottles and dusty knickknacks. On the walls hang Saints and LSU pennants and photos of jazz musicians, regulars and friends. Left from the bar, the back room holds a few tables and chairs positioned in front a big screen TV and a table that offers free food on game days. The people who come to Vaughan’s for Saints games tend to be rowdy and spirited. There is a feeling among the fans that they hold responsibility for the outcome of not just the game but of every play, to which they respond with shouting, cheers, and jeering that rise at times to the level of hysteria. “What time is it?” calls Dee. “Turnover time!” answers the crowd. Some people eschew these histrionics. Others revel in the fever of the atmosphere. Between plays they chant and sing the names of the players. If Jeremy Shockey catches the ball for a big play they sing, to the tune of the Mardi Gras classic, “Hey pockey way”, “Hey, hey, hey, hey, hey Shockey way.” When Reggie Bush makes a play, some are likely to chant “L-S-U, L-S-U,” a reference to his days as a star player for the Tigers. When the Saints score, the room erupts into cheering, high fives, hugs. The Vikings game turned out to be one where the game, and Saints history, turned on every play. The people of Vaughan’s were hanging by their fingernails through the whole thing. In overtime Garett Hartley was going for a forty-yard field goal to clench the game and send the Saints to the Super Bowl. The room went silent. Everyone was holding their breath, focused with all their collective might on the television screen. Hartley kicked and the ball flew, tumbling end over end, straight and low, right down the middle of the goal posts. The tight wire tension snapped into a roar of joy. People who were sitting jumped up. People who were standing fell down. Strangers jumped into each others arms and some people just stood there screaming. A few people chanted, “Black and gold Super Bowl!” As is tradition, someone punched the jukebox to play “When the Saints Go Marching In,” and the Saints fans of Vaughan’s, singing along, danced out of the door into Dauphine Street. 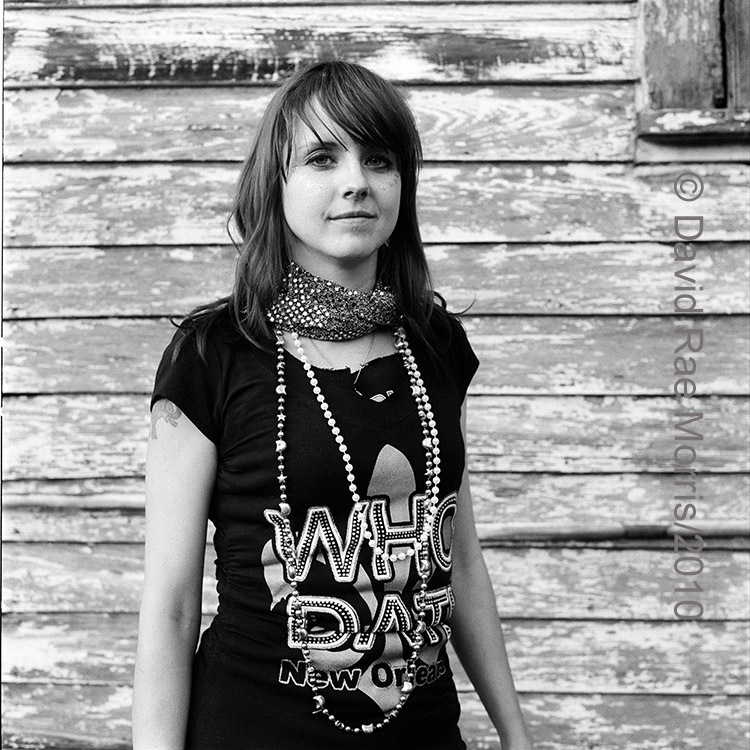 The Saints truck parked outside cranked up and lead the second line up Lesseps, past the waving patrons spilling out of BJ’s on the next corner, up Burgundy Street and down France back to Dauphine, everyone singing and shouting. The atmosphere during the Super Bowl was the same as usual, only more giddy and surreal, people exchanging taut smiles with an air of drunken nervousness. Our team was the underdog, but we intended to believe our way to victory. Whether it was out of faith, talent, trickery or luck, when Tracey Porter snatched the ball away from the Colts at the end of the fourth quarter and sprinted downfield, we knew the Saints had won. The reaction at Vaughan’s, and I guess the whole city, was a kind of giant, lasting laughter of disbelief. The day after, I went down to Vaughan’s to join the post-game discussion. Cindy, the owner, came in with a stack of Times-Picayune newspapers, a difficult score that day, and handed them out to the few people gathered there. We thumbed through the paper and recounted again and again our favorite plays. It was hard to talk about anything else for a little while, including the newly elected mayor and approaching Mardi Gras. Weeks after the Saints won the Super Bowl, the game was still playing over and over again on the big screen television in the back room. The original owners of Vaughan’s, Laura and Weebo Vaughn, opened the place in 1959. Cindy bought the bar from its second owner in 1981. The rusty sign screwed to the outside wall reads: “Vaughan’s Restaurant Po-boys Daily Specials Seafood.” In the eighties and nineties, Navy personnel from the nearby base came in for lunch. Vaughan’s doesn’t function as a restaurant these days, but if you’re hungry there might be free food in the back room, and people often bring in food to share. Most nights, there aren’t many people hanging out. Those who live nearby and have been out bar hopping might stop in for a final drink on the way home. But there are certain times, besides Saints games, when Vaughan’s becomes the place to be. On Twelfth Night, the official first day of Carnival, revelers catch the Joan of Arc parade and various parties around town then congregate at Vaughan’s for the season’s first night of pageantry. Thursday night is the big live music night at Vaughan’s. For the last eighteen years, trumpet player Kermit Ruffins, a favorite and of locals and tourists, has played a regular gig with his band, the Barbecue Swingers, setting up in the front corner of the close space. Students from Uptown and adventurous tourists in the know looking for a “real New Orleans bar” crowd the dance floor and hang out on the bench outside. There’s a cover charge, but neighborhood locals pay half price. The corner that Vaughan’s occupies is on the lower end of the Bywater, a neighborhood downriver from the French Quarter—trendy but still affordable enough for artists and the working class. Built as a suburb in the late nineteenth century, the neighborhood of mostly one-story houses on small lots was originally populated by creoles and immigrants. In the 1960s and 70s, the Bywater, like urban-core neighborhoods all over America, suffered a “white flight” to the suburbs and a period of economic decline that drove blight and crime. However, a renewed interest in the virtues of urban living following the energy crisis of 1979 and other factors such as skyrocketing rents in the French Quarter inspired a slowly swelling influx of bohemians and artists to move in. On their heels came people with money interested in preserving the historic houses. The downriver end of the Bywater, what I like to call the “dirty end,” is less gentrified than upriver, nearer the French Quarter. There are still enough black families occupying the Victorian shotguns and Creole cottages to call the area racially mixed, and the relations between them and the young white newcomers are friendly if distanced. Although I wouldn’t call the neighborhood dangerous, it’s still dodgy enough that the three bars—Vaughan’s, BJs, and one that keeps changing names—in the three-block radius referred to as “the Barmuda Triangle” keep the doors locked. What attracts people to the Bywater neighborhood is not just the quaintness of the historic cottages but the quality of life. Even as an urban neighborhood with shifting populations, the Bywater retains a strong sense of community. It’s a walkable, bikeable, neighbor-waving-at little place. According to urban sociologist Ray Oldenburg, corner bars are an essential feature of healthy neighborhoods, serving social functions apart from providing alcohol. Vaughan’s is what Oldenburg would call a “third place.” Home is the first place. Work is the second place. The third place is neutral ground, the hangout spot on the corner where people go to pass the time in conversation with their neighbors. One of the functions of third places, says Oldenburg, is to unify neighborhoods. Neighborhood bars such as Vaughan’s serve as social anchors that foster a sense of community, a concept that defines life in New Orleans more than most cities in America, maybe every city. The bar hosts memorials and second lines for members of the community that have passed away. The owner contributes money to little neighborhood festivals and groups such as St. Ann, the walking parade that marches from the Bywater to the French Quarter on Mardi Gras day. These events contribute to a sense of unity and neighborhood identity that inspires not only attachment but pride—a thing that is good for both the neighborhood and the people that live in it. “Social well-being and psychological health depend upon community,” says Oldenburg. As a third place, the traditional local tavern, in contrast to the modern suburban strip mall variety, draws eighty percent of its business from people living within a two-block radius. Not that I’ve done a survey, but Vaughan’s is probably close to that statistic. The people I watch Saints games with are the people I wave to as I ride by on my bicycle, the people I see out walking their dogs, the people I run into at the coffee shop and the corner store. The function that the local neighborhood bar serves goes back to colonial times. Madelon Powers, a history professor at the University of New Orleans, writes about nineteenth century saloon culture. In colonial times, as in the nineteenth century, taverns “served as clearinghouses of for all kinds of information, be it local lore and gossip, political news, job opportunities, sporting-event updates, or any other topic of current interest.” This tradition clearly holds at Vaughan’s. On a typical afternoon the bar is a quiet but friendly place. Newspapers lay open on the bar. The refrigerator, an old retail beverage case, hums from the corner. A crew of regulars, mostly middle-aged white people who have known each other for ten, fifteen, twenty years, discuss what’s in the paper that day and talk about health care reform, taxes, and the Mayor. They share neighborhood gossip, stories and memories. They stop in on the way home from work to discuss the minutiae of their daily lives. People swap jokes and talk about their grandkids, cooking, gardening, social values and parenting. “I told my daughter, ‘You do what makes you happy. So long as you’re happy, you’re good.’ ” In the third place, says Oldenburg, “the sustaining activity is conversation which is variously passionate and light-hearted, serious and witty, informative and silly.” Any subject can come up and anyone can drop into the conversation. Along with beer, whiskey and wine, Vaughan’s serves up what Oldenburg calls “the tonic of friends met in numbers.” Sometimes the numbers are a room full of Saints fans screaming and high–fiving. Sometimes the numbers are a handful of regulars having a chat after work or a group of bar-hoppers making a last stop at the neighborhood spot. They come for the company, the music, the camaraderie. Sometimes it’s the place to be and sometimes it’s just a place to be. For those in the neighborhood and the tourists that bravely take cabs downriver from the French Quarter, the lasting appeal of the dingy bar at the corner of Dauphine and Lesseps emanates from the localness of spirit. Vaughan’s is a place I go when I find myself wanting company, not the company of good friends but the light-hearted easy human association of the neighborhood dive. I walk three blocks from my apartment and press the black button next to the door, sounding a buzzer. After a moment the lock clicks open and the people at the bar turn to see who’s come and greet me by name. A dog comes up to give me a sniff. Sliding into a bar stool, I ask for a Bloody Mary or a Miller Lite, depending on my mood, and wait to see what the talk of the moment is. Sometimes it’s still the Super Bowl.